Part bar reference and part distinctive decor, this print showcases twelve classic cocktails. Whether it's an aromatic Sazerac or a soothing Hot Toddy, your favorite whiskey cocktail is suitable for framing. 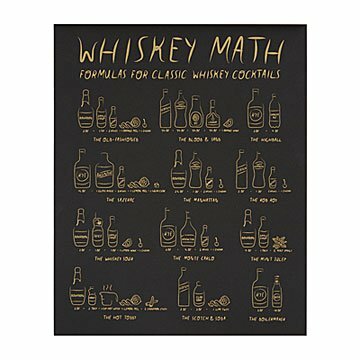 Theresa Berens' hand silk-screened poster is part bar reference and part distinctive decor, showcasing twelve classic whiskey cocktails in an enticing gold ink infographic. The collection of playfully rendered recipes makes a great gift for whiskey lovers and home mixologists. Handmade in New York City. Add our solid oak framing rails that magnetically hold your print in place. Easy to install and reuse, they"re a cleverly designed solution for print display. Raised in Omaha, designer, illustrator and printmaker Theresa Berens is based at the border of Queens and Brooklyn. She launched her career as a storyteller via journalism and editorial design before transitioning into nonprofit work, eventually starting a line of greeting cards and prints. Laced with humor, the voice of her illustrations is playful, lighthearted, and sometimes over-the-top, like a conversation between two best friends. Theresa's work is drawn with a can-do attitude and plenty of admiration for feminism and DIY culture. True to her love of all things handmade, she silkscreens a selection of her prints out of a studio in Manhattan. Print arrives rolled in tube. Magnetic oak frame arrives with hanging hardware. Some assembly is required. A great gift for the cocktail lover! I framed this and will be giving it to them as a Christmas gift this year! Really hoping they like it! Uncommon goods always without fail for years has the perfect gift for my husband.